Impoundments are much younger than most lakes and their ontogeny proceeds much more rapidly, largely due to rapid construction and filling, submergence of pre viously terrestrial soil and vegetation, and high particulate load from the watershed. The process of water quality changes during and after an impoundment is filled is known as 'aging'. Generally, impaired water quality is observed during the early life of a new impoundment. Recent research has focused particularly on productivity and on release of substances, including methyl mercury, from flooded soil. The duration of the aging period depends on retention time, nutrient load, climate, and character of the submerged soils and vegeta tion. During the aging process an impoundment ecosystem adjusts and reacts to changes in the external organic and nutrient load and the internal dynamics of developing biological communities. The duration of adverse conditions is relevant for water quality manage ment and impoundment use, particularly in the case of drinking water supplies. 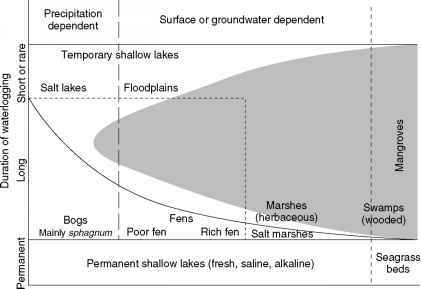 The classic 'reservoir paradigm' about impoundment aging is based on the idea that high rates of supply of organic matter deriving from the decaying submerged vegetation and of nutrients leaching from the soil will stimulate primary production as well as decomposition. The most severe impacts are on oxygen concentrations, particularly in the hypolimnion, and on water color. Both effects lead to the need for more difficult and expensive treatment for water potability.